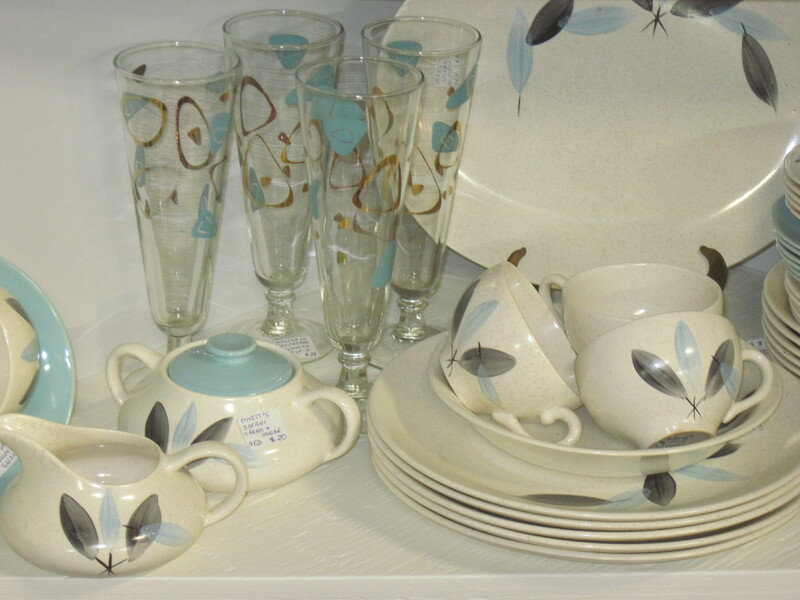 Myott Safari mid century dishes with turquoise and grey leaves on a speckled background. These were found at a local thrift store and were in mint condition. The tall pilsners are by Federal Glass Co. and the gold and turquoise pattern is sometimes called ‘Ameoba’ or ‘Atomic’ . Note: This set has been SOLD!! very, very, very nice! the two sets go nicely together. great finds! Thanks reretro. Mid century dishes with atomic designs are so popular right now that I can hardly keep any in stock. They fly off the shelves as soon as I put them out for sale. Do you know the specific pattern for these dishes? I’ve tried, with no success, to find it. The Safari style has quite a few different patterns. Thanks a bunch! I wish I knew the pattern name for you but I have researched as well with no success. If I ever find out the name I will post it for you. Thank you for your reply. I will continue to look for the pattern name.